My parents are usually on the late side of technology adoption curve. They got a color TV in the 1980s and cable about five years ago. About a week ago, though, their home acquired a Wi-Fi hotspot. I wasn’t the one who did the installation, though, it was my father. He was game when I explained that Cisco promises their new Valet wireless router will take only three steps to install. Here are the three steps and how he fared. Step One: Insert the Easy Setup Key into USB port on your computer. Once my father realized that he had to pull the cap off the key in order to insert it into the USB port, all was good. The dialog box did not pop up with the option to click on “Connect to Your Cisco Valet.” However he didn’t have any trouble with the second option. Step Three: Follow the on-screen instructions to install your Cisco Valet. This amounts to explaining how power up your Valet and connect it to your broadband modem. Then you’re instructed to wait while it does the rest. This posed no problem for my father and he was up and running in no time. Once you have your Valet working, you can plug the Easy Setup Key into other computers and it will automatically transfer the wireless access settings. I tried it on computers running Windows 7, XP and OS X, and it worked for all the new machines. An old XP machine at my parents house, though, came up with an error message. Cisco explained that machines running XP have to have service pack 3 installed. (Get service pack 3 here.) Service pack 3 came out in the summer of 2008, so machines purchased with XP after that don’t require you to install service pack 3. The Valet’s other great feature is guest access to your wireless service. The guest network delivers wireless access to the Internet, but is walled off from your home network, which means users can’t see your files or use your printers. When you enable guest access, another Wi-Fi hotspot name will appear in the list of available networks named with your network name and the word "guest." You create the passkey, so it can be something you can easily remember. Be sure to tell your guests that the guest network will appear to be unsecured and that they'll need to open their device's web browser and input the passkey to actually use Wi-Fi. LOVE TOO HAVE A CISCO THEY ARE THE BEST MY AT&T WIRELESS IS ALLWAYS LOSING CONNECTION. This looks like an item even my parents can figure out how to use. Can you clarify the issue? Can you clarify what you mean by your F: drive? 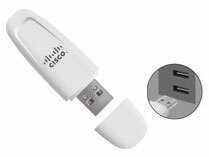 Do you mean that your computer doesn’t recognize the Cisco USB key when you plug it in? If so, is there another USB port on the side or back of your computer you can try? Almost all PCs have more than one.